It’s no secret that San Francisco is a beautiful city. 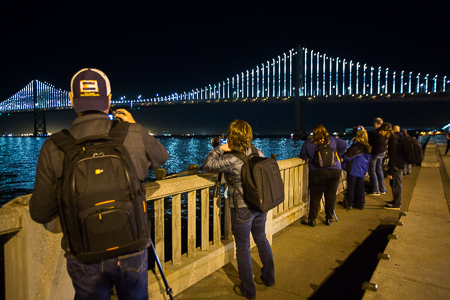 Every year, millions of people come to the bay to discover the San Francisco experience. 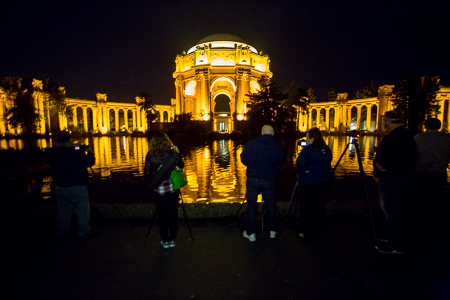 What many people don’t realize is that San Francisco is just as beautiful at night as it is in the day, and here at Aperture Academy we are no strangers to the night. 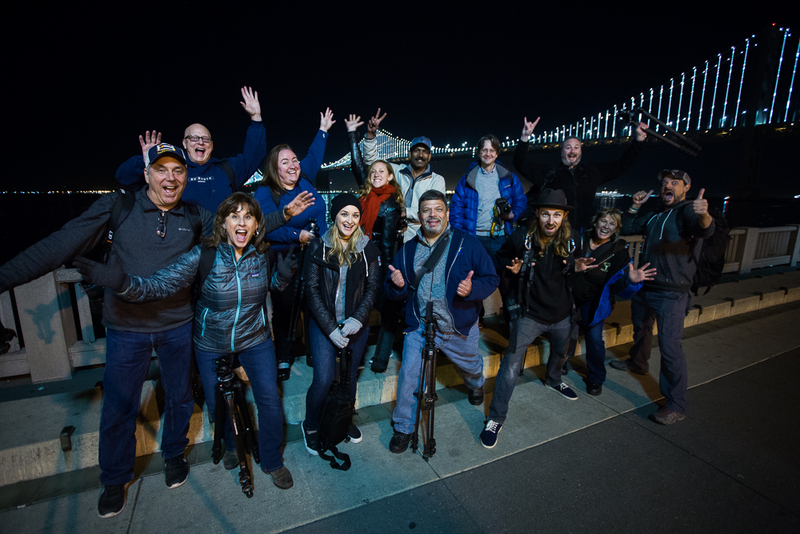 Scott Donschikowski and I met up with a fantastic group of photographers on a surprisingly warm night in Marin City. After everyone had a chance to introduce themselves we got the ball rolling and headed out into the night. The first stop was the Palace of Fine Arts. This place is an absolute San Francisco gem. The building is reminiscent of ancient Greece with a beautiful reflection pond that surrounds the front of the building. It’s almost as if the designers had photographers in mind when they built it. The group set up their gear while Scott and I rattled off a few camera settings to help everyone get into the flow. There is often a decent amount of questions at the first stop, so Scott and I took our time walking back and forth to check in with the photographers as they worked the scene. 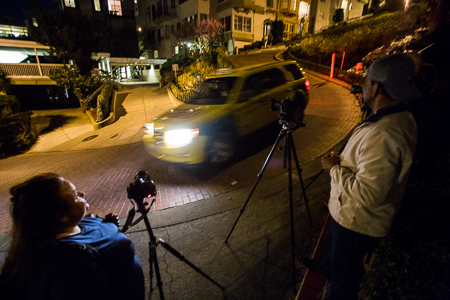 After about an hour of shooting we packed up and headed to Lombard Street. 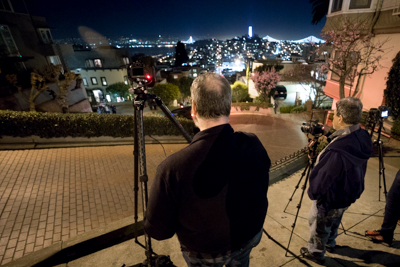 Lombard is a classic San Francisco scene but shooting it at night adds a whole new dimension. 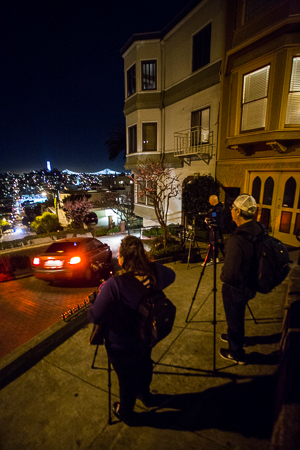 We made sure to open our shutters for long enough to capture headlights and taillights streaking down the curvy street. Half the group shot from the bottom and the other half of the group shot from the top. After a half an hour, the groups switched places to see how the perspective changed the scene. Next on the list was the beautiful Bay Bridge. 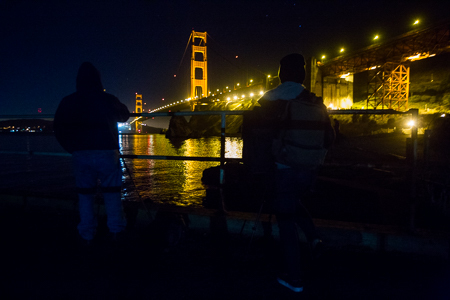 A few years back, the city hung LED lights on the suspension cables making for a spectacular visual. Everyone lined up and began to experiment with different compositions as they worked. Finally it was time for the last shoot of the night. Scott and I took the group to Fort Baker which is often over looked by photographers. The fort has a great view from below the Golden Gate Bridge. We worked the scene for quite some time and before we knew it, it was past all of our bed times. 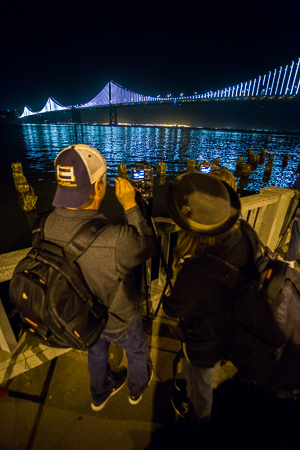 The group rode back to our meeting point in Marin City with memory cards full of wonderful nightscapes that paint a beautiful picture of San Francisco at night. After saying all our goodbyes, the group parted ways and I assume quickly went to bed.